Rockets launched from Kennedy Space Center are aimed towards the Atlantic. Assuming a launch goes as planned, the rocket will not fly over a populated area. The Space Shuttle, for example, jettisoned its fuel tank and solid rocket boosters out over the Atlantic about two minutes into launch. But what if something went wrong? What if a rocket malfunctioned, went off course, and headed straight for a city along the eastern seaboard? Source: Huntsville Real Estate Blog. Range safety panel, dating from launches in the 1960s. 1. The Range Safety Officer can stop a launch from happening. Kennedy Space Center Mission Control is literally unable to ignite a rocket until the Range Safety Officer flips the switch permitting the launch to proceed. If the Range Safety Officer determines that the rocket is not functioning correctly and may veer off course and endanger a populated area, protocol requires him or her to prevent launch. 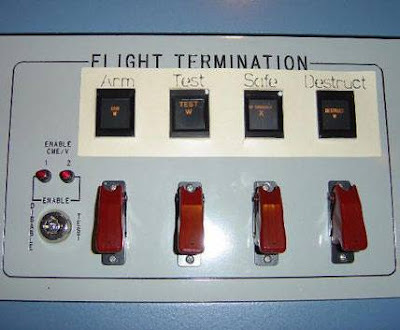 For example, during the Space Shuttle Discovery's final flight last year, an error message gave the RS Officer pause. So, he waited to throw the go/no-go switch until he had resolved his questions about the error message. This left NASA mission control only two seconds to launch before that day's launch window closed. RS Officers can also stop launches near the Atlantic if boats stray inside the security perimeter downrange of the launch. They even stop launches if high-altitude clouds are present, since these clouds cause radio interference. Radio interference could prevent an RS Officer from fulfilling the second part of his or her mission, described below. The Space Shuttle's flight path. 2. The Range Safety Officer can detonate a rocket if it threatens a populated area. Every single rocket launched from Cape Canaveral is wired with explosive charges. 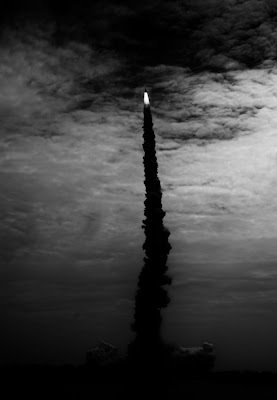 If something goes wrong and the rocket veers off course towards a populated area, the RS Officer must send a radio signal to the rocket, detonating it. This even applies to manned launches. In some instances, the spacecraft itself is also armed. A Space Shuttle Solid Rocket Booster. See the Range Safety detonation system near the top right. RS Officers have made the grave decision to detonate NASA rockets a few times over the years. 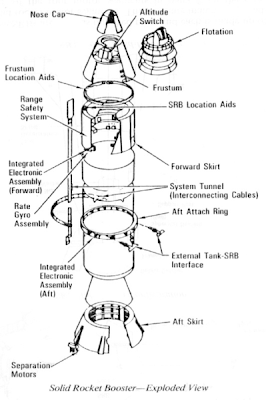 For example, 43 second after launch in 1961, an Atlas rocket was detonated when it stopped following its flight plan. The unmanned Mercury capsule strapped to the Atlas was saved by its launch escape system. Similarly, five minutes after launch in 1962, Venus-bound Mariner 1's rocket malfunctioned, and had to be blown up by a RS Officer. Astronauts have never died as a result of an RS Officer's detonation command. But, on one occasion, an RS Officer has detonated a manned launch. 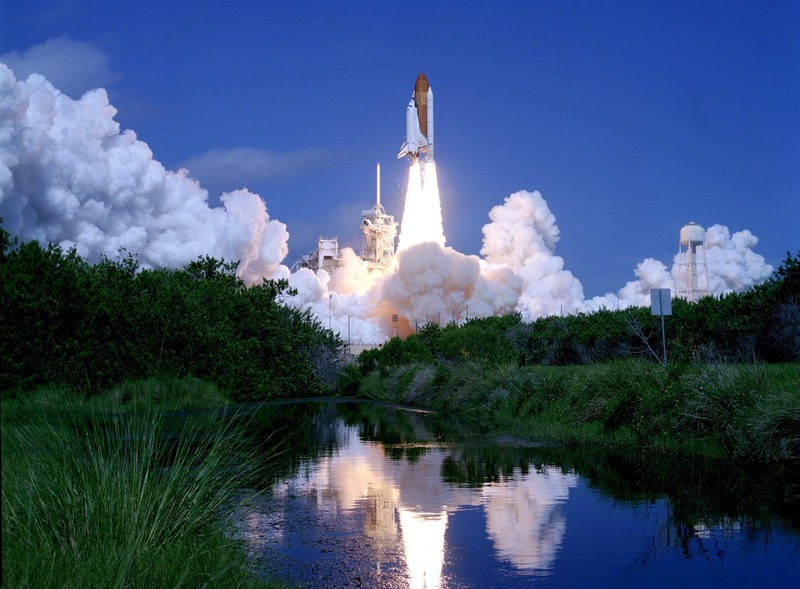 After Challenger broke apart during its launch in 1986, its solid rocket boosters were still flying, unguided, off the Florida coast. So the RS officer had to destroy them. dangerous for the astronauts, and for folks on Earth. One night I told a well-known and politically powerful upper-air scientist that the unguided Aerobee [rocket] would impact off the range. Therefore, I told him he should cancel... He said he was the Project Scientist, he needed the data, the delay would result in a budget over-run, and therefore he was going to launch. I replied that I would push the destruct button the instant the rocket cleared the launch tower. He launched. I pushed the button. The commanding officer called me into his office the next morning and asked me what happened; I told him. Nothing more was said because the Word of the Safety Officer is the Word of God. There can be no tribunal that can over-rule or second-guess the Safety Officer. There can be no retribution against the Safety Officer. He calls the shots. If he calls to many unsafe ones, the range commander... transfers him to some other position. It may seem creepy that an already incredibly dangerous space mission is made even more hazardous by wiring demolition charges to the rockets. But space flight will always be risky, and RS officers make it a little safer, at least for those of us on Earth. Thanks to RS Officers, no one on Earth has ever been killed by a NASA launch. A cheery addendum to this post: My dear friend Paulina hosts an awesome website, Smile Play Learn, where she explores books, crafts, and activities with her two little boys. Just a few days ago she blogged about a neat outer space project: making a diagram of the phases of the moon. Isn't that a fun idea? Sources: Yarchive.net; Collect Space; Space.com; Wikipedia; NASA; Popular Mechanics; Wired4Space. Wow! Talk about pressure! The anecdote really leaves you chilled to the bone. Thanks for the comment, Abraham! It seems like being an RS Officer would be a truly frightening job, at least for those first few minutes after the launch!